CES 2015: Dan D'Agostino unveils MLife integrated amp with built-in streaming | What Hi-Fi? Dan D'Agostino has announced the launch of MLife, a new integrated amplifier that builds on the design of its Momentum amplifier by adding in streaming capabilities including Bluetooth and AirPlay. MLife makes use of the same amplifier and preamplifier circuits you'll find in the Momentum, but one noticeable difference on the exterior is the lack of tone controls, replaced by a 5in LCD display. Not only that, but Dan D'Agostino has developed an Android and iOS app that'll let you stream music to it via Apple AirPlay and aptX Bluetooth. You can also use the wireless connection with computers. In addition to its streaming capabilities from your mobile or computer, the MLife has built-in access to vTuner internet radio stations and Tidal's new lossless music streaming service is also available. MLife's amplifier section delivers 200W per channel into 8 Ohms, with the power supply located in its own aluminium enclosure. All analogue circuit boards are built using through-hole construction. 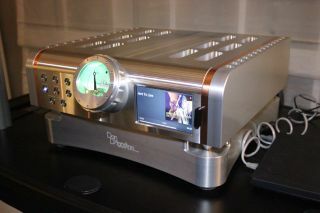 The MLife integrated amplifier is expected to go on sale in March with its eye-watering $48,000 price tag. The device also impressed us on the CES 2015 showfloor to pick up a Star of CES Award. In addition to MLife, we also got a first glimpse at Cinema Standard at CES 2015 – Dan D'Agostino's two- and three-channel amplifiers that can be used as part of a hi-fi or home cinema system. Each channel of the Cinema Standard delivers 250W into 8 Ohms, with both versions built into a 6U chassis with front and rear rack-mounting brackets. XLR inputs are provided for each channel. Elsewhere, built-in, switchable high- and low-pass filters make it compatible with powered or passive subwoofers. It costs $12,000 for the two-channel edition and $15,000 for its three-channel sibling.